Open Field Drawing Club Returns! Last summer we started the Open Field Drawing Club as an opportunity for artists and the public to gather, converse and create collaborative artworks. While many wonderful pieces were produced, the intent was to create a comfortable space for artists to socialize and meet outside the usual places (openings, artist talks etc.). What we wanted was a situation where art could be fun, loose and just an excuse to talk to your neighbor and have drink outside. What developed was a loose group of regular attendees as well as dozens of new members at each session. The collective created thousands of drawings by the end of the summer, which according to the rules of drawing club, remained with the club as no singular artist can claim authorship to any piece. This week we are jumping into summer and a new season of the Walker Open Field. Drawing Club also returns for its second season with several new additions and surprises in the coming months. So here is a quick overview of the program in case you missed it last year and a rundown of what is new. The spirit of Drawing Club is built on sharing, collaboration and social experience of art making. 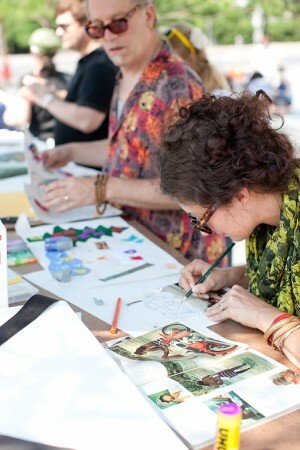 Here is how it works: Drawing Club meets every week under the trees outside the Bazinet Lobby in the Open Field Grove. Members of the public are invited to join with local artists, grab a pencil and share their contributions. All supplies are provided. The center of each table will contain the working pool of pieces (including works in progress from prior weeks). You can start a new drawing, slide it back into pool, pass it around, alter, edit, and amend it until the group declares each piece complete. The finished works will be collected and displayed throughout the summer in our completed portfolios. What can beat making art under a grove of trees with a cold drink! Just show up. No registration or RSVP required. Drawing Club is open to everyone. Drawing Club meets every Thursday from 2pm -7pm from June 9th to September 1 in the Open Field Grove. Nothing but yourself, and maybe a friend. All supplies are provided. The core of Drawing Club is the same, but in response to feedback from last year we are adding a few new elements to keep things interesting. Guest Artists: We are hoping to have several surprise guest artists join us throughout the summer….you never know who you might be drawing with. Theme days: We may introduce theme materials or themes for specific days to challenge artists to integrate new approaches or experiment with new materials. Demo Days: We are partnering with Wet Paint Art Supplies in St Paul to bring in several guest artists for special demos within drawing club. The artists will be teaching techniques and reveling some of their tricks. Wet Paint is also generously supplying materials for “try it” sessions on select dates. New Materials: We have introduced several new materials and options for Drawing Club members to choose from…hopefully this will lead to some unique outcomes and surprises. Discussions: We are inviting Drawing Club members to propose and/or lead discussions around topics of your choosing during sessions. These could be art related or not…the choice is up to you, but we would like some scattered organized discussion to occur throughout the summer…think the discussion you might have with your artist friends over a drink. Contact me or one a member of our team if you are interested. Portfolios: We will be keeping ongoing portfolios of finished work at the tables…so you can see how your pieces may have transformed and found completion from week-to-week. Last year’s Drawing Club team returns with a few new additions. As with last year, we will be outside participating along side you for the summer. I hope to see you this summer and those of you that are teachers….Drawing Club is ideal for your students.